Hush, my Baby. Be still inside me. Rest my Child. All is well. Hush, my Baby. Grow inside me. You are safe there, my little girl. I can’t believe that I would ever think that you were not to be. But, darling, mommy feels like a child herself. And I will give my life to love you, little one. And I will give my life to protect you, darling. Always. Hush my Baby. I’m dreaming of you. And wondering just who you’ll become. Hush my Baby. Smile inside me. Warmed by knowing you are loved. I can’t believe that I could ever think of life without you. But, darling, mommy sometimes feels afraid. Hush my Baby, smile inside me. I first heard this song during the ending credits of the new movie, ‘Sarah’s Choice,’ starring Rebecca St. James. I had been eagerly anticipating the release of this movie that portrays a single woman who must make the decision whether she is going to choose life or death for her unborn child. My expecations for this movie were definitely met! In fact, more movies like it need to be made. The story really struck a chord in my own heart because in the story of my own real life, I am dealing with a situation very much like this one. The story is raw and it is powerful and I feel like I understood everything “Sarah” was experiencing. Over the past few months, I have had to make the decision about what “choice” to make with my own unborn child. Then, I realized I really don’t have much of a choice. The choice was never mine to make. God gives and God takes away. I feel like the words to this song truly echo the words that my heart longs to express. How could I have ever lived my whole life without knowing my precious daughter? How could I have gone without ever holding her, kissing her, knowing her? I can’t fully explain the joy and peace I feel these days and months that I’m carrying my baby. Feeling her kick and move is unbelievably exciting and amazing! It seems like whenever I try to let someone feel, she always stops! But, my little sister finally felt her kicking last night! Just knowing what is going on inside my body is enough to keep me thinking and pondering forever about God’s goodness and awesomeness. What once seemed to be the thing that would end my life is now the very reason that I live. Sure, my life is going to be different now than what I had originally dreamed or anticipated. 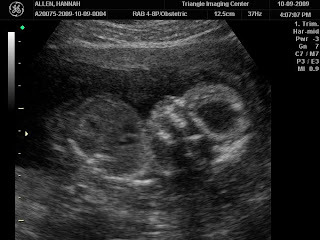 But, God has so much planned for this little life growing inside me. And so much planned for me! He is already giving me a new vision and new dreams for my life! I now see that being unmarried and pregnant is not a sin in itself, but what got me here was the sin. My baby is not a sin. She is still a blessing and nothing to be ashamed of! I have turned from my sin and walked away, and God is blessing me for that. He is taking a situation the world would look at as horrible and impossible and bringing Himself glory and changing my heart for the better. My sweet Lily almost never got the chance to live. But, my God saved her! (there will be another blog with more details about this at a later date.) Praise you, Jesus, for breaking my heart and saving my child! And God saved me. He is truly an awesome, amazing God with a heart full of love and compassion. God, teach me how to love this baby. Teach me how to be a mother. Give me your heart, patience, guidance, strength, wisdom, love, and peace. I feel so inadequate to be entrusted with such a great responsibility! But, I know you alone will give me what I need to get through each new challenge and each new day. And when that day comes, which is soon, that this lily-white princess is born, I will truly be looking into a face showcasing Jesus’ love, forgiveness, and redemption. I long for the day I can gaze into her blue and curious eyes and know that I made the right choice. Life. And what a beautiful choice it is!